In a previous post, we covered channel modes, bans, extbans, invex, and exceptions. In this post, we will cover user modes. There is some overlap with the letters used, so it is important to distinguish between the two lists. i — makes the user ‘invisible’ to anyone who is not in a common channel when the /who command is used. This prevents other users from ‘spying’ on channels they are not in. This mode is locked by the server and cannot be removed. Conversely, some servers do not set this on-connect by default, so your client may try to set it. Because it is locked, your client will give you an error message saying as much, and it is already applied. I — removes the list of channels a user is in from the /whois output. This mode is not locked, so users may remove it themselves if they wish by using /mode [ownnick] -I, however we set this on-connect to help cut down on stalking. Please be aware that if you remove this mode from yourself, we will merely reset it if you come to #help complaining about another user following you from room to room. Removing +I does not allow users to see you in any channel you are in that is set +s (secret) unless they are also in the channel with you. x — masks your IP address from showing. If you /whois yourself, you will see your own IP address, but regular users cannot. This mode is locked by the server and cannot be removed. However, if you have a vhost set, the server will mode you -x in order to set the vhost (This does not reveal your IP at any point), which also masks your IP using services rather than the server itself. w — enables a user to see wallops messages. We do not use wallops, so this mode is kind of useless on our network, since regular users are not permitted to use the wallops command. However, it is not an issue if your client sets it. B — indicates that a client is a bot, and we require that all bots on the network set this mode, so it makes it easier for Opers and users alike to differentiate between the two. For mIRC bots, simply add /mode [botname] +B to the perform commands. For Eggdrops, add it to the appropriate section in your configuration file or whichever perform script you use. These are the only two bot types that we provide support for. However other bots usually have some sort of perform feature, we just will probably not be able to tell you where to set it. c — prevents any user who is not in a common channel with you from sending you a private message or notice. g — CallerID. Once set, only users you have permitted to send you a private message will have the ability to do so. You will get a notice from the server saying that someone wishes to send you a private message. If you don’t want to allow it, simply ignore the notice. If you do want to allow it, simply /accept +[nick], and their messages will come through. 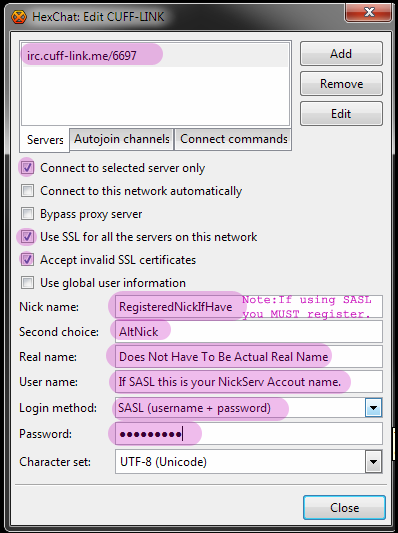 You may setup your accept list before setting +g and add/remove multiple users via /accept +[nick1], +[nick2], -[nick3], -[nick4] (If you do not put commas between each parameter, the accept list will not set correctly). To see your accept list /accept *. R — only lets private messages from registered users to come through. S — strips all colour from any incoming private messages or notices not including channel messages.